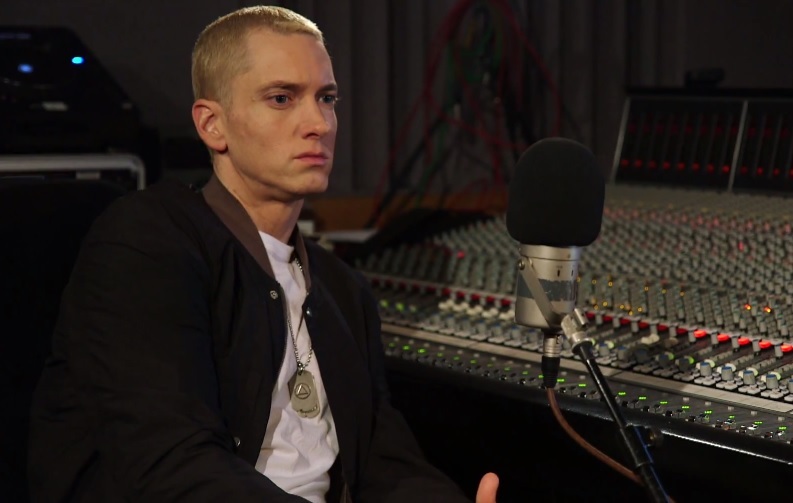 BBC and Zane Lowe release part two to their exclusive interview with Marshall Mathers. The rap superstar opens up on his style of production and shares his thoughts on getting back behind the boards for The Marshal Mathers LP 2. Lowe points out Eminem’s upbeat production on the new album while the Detroit native reassures viewers his passion for Hip Hop is far from gone. Marshall speaks on his love for rhyming, making music and points out the best thing he enjoys is having an outlet to continuously express himself with. As the conversation between the two continued, Eminem weighed in on how he deals with fame and explains that he never had any intentions in becoming a Pop star. The rapper also addressed his debut single, “My Name Is,” and reflected on his struggle in the past with drugs. This entry was posted in In The Studio, Interview, Video and tagged 2, BBC, eminem, Interview, MMLP2, Part Two, Radio 1, zane lowe. Bookmark the permalink. VIDEO: T-Pain – Up Down (Do This All Day) Feat. B.o.B.